S Bryce Kozla: T-Rex Tea Party at the Library! T-Rex Tea Party at the Library! 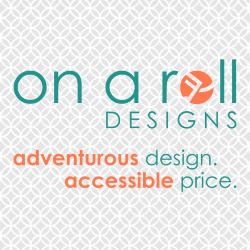 This post was authored by Jennifer Johnson, my amazing 2018 blog intern. Check out the rest of her programming posts here. Happy spring! This month’s program is a perfect mesh of high-interest topics for kids from all walks of life. If your young patrons love tea parties, dinosaurs and/or free snacks, then this program is sure to be a hit! And what’s great is that I was fortunate enough to be able to take it on the road as an outreach program as well. Are you ready to dine with the dinosaurs? Here we go! In addition to my public Book Worms program, I also take these monthly programs on the road to three different outreach groups. When there’s food involved, this can get pretty expensive if you’re not careful. 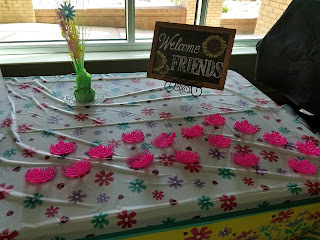 By not getting too hung up on serving the prettiest tea party snacks, I was able to put on four separate tea parties for roughly one hundred kiddos for somewhere between $70-80, which is less than a dollar per child so I was pretty happy with that! Below is a list of the snacks and materials that I bought and portioned out in quarters among the groups. 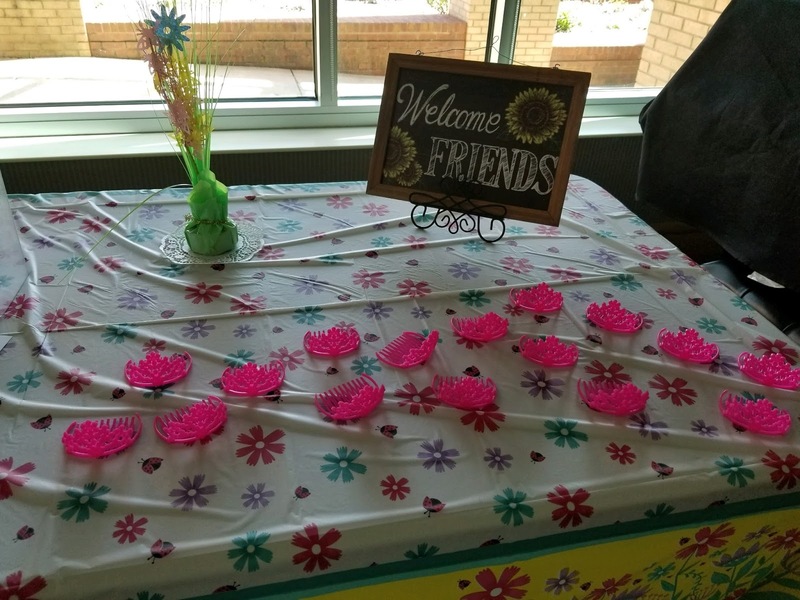 A decorated table with a sign that says, "Welcome Friends"
We already had a stockpile of plates and napkins, as well as a box of Airheads candy left over from another program that I portioned out with the other snacks. I didn’t do fancy table decorations for the outreach programs because the pretty dishes I brought from home were too difficult to transport, but we did put out flowers, decorations and table scatter for the public program. When taking the snacks on the road, I brought all the cake carriers I had at home and put the cookies and snacks in them ahead of time so that everything was already counted out. I also made sure to bring food service gloves with us so that the instructors at the sites could help us pass out food. Peaking out of the tote bag is a "Jurassic World"-branded snack bag. The tea recipe that I used can be found here. I did have to spend some time in our kitchen before each program to make sure the tea was freshly brewed. Luckily, the library had an insulated carafe that we were able to borrow that kept the tea at an agreeable temperature until we were ready to serve it. Our teen librarian owns an inflatable T-Rex costume and was kind enough to let me borrow it. Two of my co-workers took turns playing the role of the lovable but clumsy beast. We coordinated with each outreach group beforehand to make sure that each site had a room where the T-Rex wouldn’t be seen by the children before he was ready to make his entrance. We also made sure to have extra batteries on hand just in case the fan that inflates the suit started to die. After we’d read the story and get the kids situated with food, we’d have a quick discussion about tea party manners and how to treat our special guest before we brought the t-rex in. Inevitably, you still have the kids who will say, “There’s a person in there!” or try to pull on his tail, but you can address those individually. Overall, the kids absolutely LOVED getting to high-five, fist bump and hug a dinosaur! We even danced to “I’m a Little Teapot” with him at the public program! Children sitting at long cafeteria tables watching the door to a classroom. Jennifer is at the open door with the inflatable T-Rex behind her. 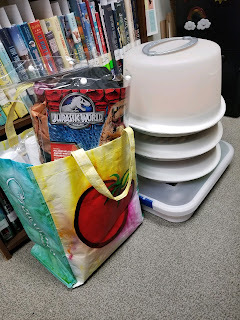 If you’re interested in hearing about some of these other story/craft programs that I’ve taken on the road or if you have more questions about how this program worked, please feel free to contact me at Jennifer dot johnson at jcpl dot net.